Part of the problem with Skylar's baseless confidence in this area is that instead of starting with the basics and working up from there, when he decides to try cooking something, he locates the most complicated recipe he can find on the Internet, gives himself a quarter of the time necessary to complete it, and begins. Skylar would say I'm being unfair here. And I probably am. He would tell you that although his cooking is not without its drama, it almost always turns out well. And that's true. The end result is usually respectable. But on the way to the end result he violates the cardinal rule carefully stenciled onto every one of your Mormon kitchen walls because there is no joy in the journey. Eli opens the oven to find red-hot shattered glass all over the bottom. Skylar: Don't open that! I'm baking! Eli: Baking what? A coke bottle? Skylar: Oh no! The glass Tupperware dish I put in there broke! Cheap piece of crap! Eli: WHY ARE YOU BAKING TUPPERWARE DISHES IN MY HOUSE? Skylar: I filled it with water so I could turn the oven into a little steam room. He took some cooking classes at the beginning of this year, and to his credit, he retained some valuable knowledge from these classes. And I hoped he would use that knowledge when he told me and Matt that he was going to cook three days ago and that we should all be at my house at 7:00. I pulled into the driveway after a long day of work right around 6:40, and I'm not kidding you that I heard literal screams coming from inside. Smoke was billowing out of the kitchen window. A high-pitched "NO GOD PLEASE NO" was echoing off of The Perfects' house. My mind went to every prized possession I own. Chubby 10-year-old freckled face child finishes drawing the last line on a tiny and impossible-to-complete maze, places it into a shoebox that is still sitting in Eli's house, 24 years later, and which hasn't been opened since. 10-year-old smiles and whispers "yessssss." I sprinted into my home, prepared to scoop up a coughing Duncan, and I found Skylar, standing over two pans that were hurling so much smoke into the kitchen that everyone with asthma in Salt Lake City died that day. And then I noticed, that instead of, oh, I don't know, moving the pans off of the heat, Skylar was standing in front of them just screaming. You know how you watch scary movies and the monster starts going after the protagonist and the protagonist just stands there and screams and the whole time you're like "RUN YOU IDIOT" and you think that the horror movie is totally unrealistic because who the hell would just stand there in the face of danger? If a T-Rex stepped in front of him, Skylar would stand there and wait to get eaten. I know that, because that's what he was doing in my kitchen. When I yelled all of the obscenities I've ever learned at him, he just turned his face and started screaming in my direction, which was even more annoying than when he was directing the screaming at the pans. I tried to move the pans myself, but he violently intervened, yelling that the pans couldn't be moved because what was in them hadn't been cooking as long as the recipe dictated. I told him "to hell" with the recipe and that he needed to use the 3 good and 2 sub-par senses the good Lord gave him to react to this obvious crisis. But he wouldn't listen. It was like that scene from Harry Potter 7 when Dumbeldore is all like "no matter what happens, keep making me drink the liquid" and then when Harry starts feeding him the liquid and Dumbeldore is begging him to stop Harry just keeps going because he was instructed to do so and so he follows the instructions instead of relying on common sense and eventually Dumbeldore is exposed as a child predator. Duncan was having panic attacks, running full sprints into and out of the kitchen, clearly frustrated that he is a dog and therefore incapable of saying words. The words I could tell he wanted to say were "can someone please take me back to the animal shelter?!" Eventually his various timers went off and he removed the pans from the heat. 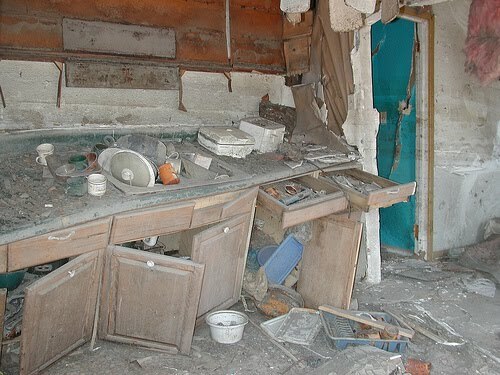 I took a picture of my kitchen when he was done. He made salmon and it was fine. But my entire house smelling like fish for at least three days isn't. He later corrected me. The cake was finished at 2:22 AM. I had gone to bed long before this. AND IT WAS A SCHOOL NIGHT. This time in Strangerville, Meg explains what a “horse girl” is. Anne Hathaway is discussed. And there’s some Eastern Europe thrown in there, too. You know obscenities? Do Bob and Cathie know this? As an avid Harry Potter fan, it is my duty to tell you that the scene you are referring to is in the 6th book "The Half Blood Prince" and Dumbledore is certainly NOT a child predator. Fine. I’ll go re-read all of them to fact check you on this. Podcast idea: Eli reads US Harry Potter. Every book. In his best Snape voice. This is why I think we should vote Kina in as president. I'd subscribe to that, especially since I don't make time to read anymore and only learn via podcasts these days. "He decided he was a cook some time ago despite never having really cooked. I suppose this is because he watched his sisters obtain this skill over the years, somehow believing that their mere relation to him made culinary arts a collective familial knowledge." Sort of like that time my ex husband tried to take apart a record player even after someone pointed out to him that it was still plugged into the wall. His response was "It's ok, my dad's an electrician", then he got an electrical shock that left him twitching on the floor. I would say "famous last words" only unfortunately he's still alive and has said many more words since then. "But on the way to the end result he violates the cardinal rule carefully stenciled onto every one of your Mormon kitchen walls because there is no joy in the journey." This made me laugh out loud. I have a friend who's dad is a toxicologist and hs dad always threatened to get one of those cutesy vinyl wall appliques that Mormon housewives are so fond of for their kitchen, only he wanted his to say "The danger is in the dose!". His wife didn't think that was funny. I remember the broken pyrex incident being mentioned here before, now it makes more sense, he was trying to make a bain marie. That isn't as crazy as it sounds. Now I'm really thinking I should have given that cook book to Meg for adult supervision. How are you two even allowed to own an oven? You remind me of a college boyfriend I had who claimed to be a good cook but all he really knew how to make was coffee. He planned a dinner party and burned everything, called me in a panic half an hour before his guests were supposed to arrive. I ordered take out and ran to the store for a cheese platter so there were be something edible in case the guests got there before the meal did. He never tried to cook again. I forgot to mention that he made the cake out of that book you gave me and it was delicious! Which cake? I really like the three layer carrot and parsnip cake but the first time I made it the way I toasted the coconut and put it on the cake make it look like the cake was covered in hashbrowns. Tasty but it looked disgusting. Nevermind I finally got not lazy enough to watch the video. It looks like it turned out fairly close to the photo, and seriously was he in the kitchen CLEANING at 2am?!? Who does that (except for me when I'm manic and only sleep 3 or 4 hours a night)? For your sanity don't try any of the folded pastry recipes in there unless you have a 3 day weekend with exactly nothing to do and zero self respect and the full expectation of failure. You guys should do a series of videos, baking with the boys, and call Meg and make HER do the dragon voice. I'd pay semi-good money for that. Skylar is all of us. Or at least, he’s definitely me. I am also you, waiting for him to make the cake. I am you waiting for the cake even while I am Skylar trying to make the cake. It’s complicated. AMY ROSE because doing comments on my phone is complicated these days too. Um, Amy Rose is actually super good at cooking and baking. And her husband is like professionally good. He's not a chef. He's a FOOD SCIENTIST. Yeah. That good. Did my previous comment go through? I spent a while typing that! If it did, don’t double publish this comment, ok please people who are in charge of this thing? “My first cheesecakes though? Not so very good. They are getting better. I did burn some of dinner a few nights back and my girls were all like, “uh, what... is this?” And I snapped my fingers and said, “hey now my mom burned food like this all the time when I was growing up and I ate it and I liked it and if you really loved me you would like it too!” Or something along those lines. My ten and six year old girls did end up trying it with me and honestly, it wasn’t that bad. It looked way more burnt than it tasted. Phew. My husband is legit. He teaches the following courses at the university: product development, sensory, carbohydrate chemistry, and baking. (Not all in the same semester, he actually spends most of his time Doug research but those are the courses he rotated through). If he ever takes his baking class online, I will tell you and Skylar so you guys can sign up for it. Amy Rose posting anonymously bc my phone hates me. This is like the second Harry Potter plot reveal in the past couple weeks with no "SPOILER ALERT!!!!" warning ahead of time. I'm on book 3 and my son with autism won't let us read the next one until the next illustrated version comes out, which is once a year. Rest assured, I have never posted anything even remotely accurate about Harry Potter on this site. Ridikkulus was my favorite dragon in book 9. But did Ren teach Harry Potter, or did Harry Potter learn from Ren? This is what I have been wondering. And while we are discussing this, who was Harry’s greatest foe, seriously: Voldemort, Darth Vader, or Spock? (Amy Rose, bored while they change the tires on my car). Selfless, beautiful and charming Skylar is a saint to have continued to make that gorgeous cake for you...and not dose it with ExLax. Skylar, if he makes that voice again, you have the internet's blessing to stop him with any means at your disposal. We got your back. I love ya Eli, but damn...that dragon voice. The stuff nightmares are made of. But in my defense, I'm very pretty and I still have all of my pogs from the 90s. I laughed during your “horse girl” discussion because I totally use that term and have people confused about what I mean too! I thought it was a pretty standard thing! The last time I used it, I was talking about how I once joined an Internet forum about how to care for long hair and get it to grow longer...only to find it was full of horse girls and/or religious fundamentalists (but they had good advice so I stuck around anyway). Also that cake looks AMAZING. I quit Facebook a year and a half ago, but then came back because I was bored, and I'm so glad I did because WHAAAAAAAT?!!!! THERE'S A PODCAST NOW?!!! SQUEEEEEEEEEEEEEEEE!!!! Oh honey. You got some catching up to do!